and color-coordinated the names based on each person’s department. 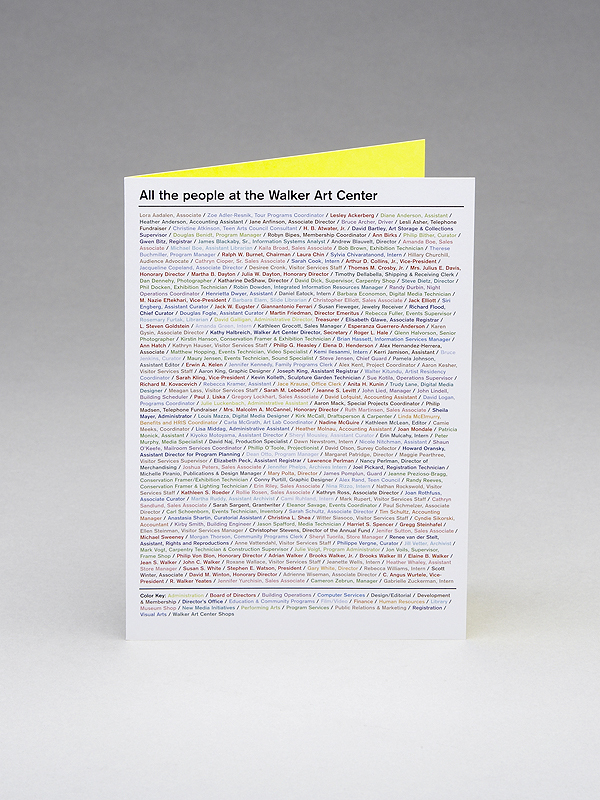 During my time at the Walker Art Center I designed all single-color print projects in black. Just before the design went to print, I would ask Michele Piranio, the studio manager, to choose a color. I would then replace the black with the chosen color in the Quark document and have a color design with one click. Michele became a part of my objective design process. She negated the need for me to make a subjective decision and became another standard, helping me rationalize as many decisions as possible within the design process. I sometimes wish there was a less subjective way of selecting color for single-color print jobs. The last time I went to the Walker Art Center’s design department, the designers showed me a big envelope full of old Pantone chips—they joked that they select color by a lucky dip.